Capitol Policeman John Cale (Channing Tatum) has just been denied his dream job with the Secret Service of protecting President James Sawyer (Jamie Foxx). Not wanting to let down his little girl with the news, he takes her on a tour of the White House, when the complex is overtaken by a heavily armed paramilitary group. Now, with the nation’s government falling into chaos and time running out, it's up to Cale to save the president, his daughter, and the country. $24.852 million on 3222 screens. Sometimes two similar films come out close together and both do fine at the box office. That occurred in 1998, when May’s Deep Impact and July’s Armageddon both attained good financial results although they focused on stories that bore more than a few connections. In 2013, we got two flicks about attacks on the White House, but they didn’t enjoy Deep Impact/Armageddon-style results. March’s Olympus Has Fallen arrived first and did okay at the US box office; its $98 million didn’t dazzle, but at least it didn’t flop. 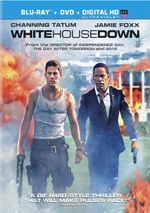 July’s White House Down suffered a worse financial fate. While Fallen’s $98 million may not have been great, it looked pretty good compared to the $73 million Down earned in the US. That becomes especially true given that Down cost about twice as much to make as Fallen. I thought Fallen offered a nearly complete dud, but I’m still enough of an action movie fanboy that I looked forward to Down. We meet John Cale (Channing Tatum), a US Capitol police officer who wants to work for the Secret Service. He manages to get an interview and brings his semi-estranged, politics-obsessed 11-year-old daughter Emily (Joey King) along so she can visit the White House. This doesn’t go as well. Not only does Cale get rejected for the job, but also a paramilitary team assaults the White House. Cale finds himself in the thick of the action and he ends up as the one with the best shot to keep President James Sawyer (Jamie Foxx) alive. My brain hates me for this, but I had a blast with Down. As I mentioned earlier, I pretty much loathed Olympus - which took itself far too seriously - but Down delivers fun from being to end. Is it stupid? Yup. Illogical? Totally. Ridiculous? Completely. But unlike the self-serious Olympus, Down gleefully embraces its idiocy and just has fun. Even its lifts from the original Die Hard feel like winks, whereas in Olympus, they come across like uncreative theft. 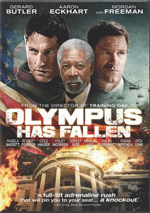 Like Olympus, Down comes with a strong cast; in addition to Tatum and Foxx, we find talents such as Maggie Gyllenhaal, James Woods, Richard Jenkins and others. Unlike Olympus, the actors show a pulse and look like they’re invested in the process. Tatum does especially well, as he aptly strides the movie’s comedic and action elements. Foxx ends up as the only mild weak link, mainly because he just doesn’t “feel presidential”. Granted, unlike Aaron Eckhart in Olympus, Foxx gets a bigger challenge as he plays a president with a more obvious real-world analogy. Sure, I guess you could view Eckhart’s President Asher as vaguely Kennnedy-ish, but it’s a loose connection. On the other hand, the casting of Foxx creates an obvious allusion to President Obama, though not solely due to race; if Morgan Freeman played the president – like he did in Deep Impact - we wouldn’t think of Obama. But Foxx’s age and look create a clearer Obama link, which one must assume is at least partially intentional. I’m glad that Foxx doesn’t simply impersonate Obama, but I still think his performance seems a little “off”. Like Tatum, he does fine in terms of the movie’s action and comedic elements, but I don’t wholly buy him as president; he just seems a little too glib for the position. Still, that’s a minor complaint in an otherwise enjoyable movie. I was shocked at all the positive reviews for Olympus, which I thought was a "D-" movie at best. I'm not as surprised by the hate for Down - like Michael Bay, director Roland Emmerich always had severe detractors - but I didn’t think it would get hammered so hard. 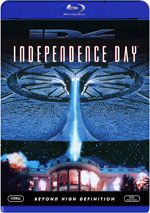 I guess if you hated Independence Day, you'll hate Down - and if you like Independence Day, you'll probably like this. They're insane, absurd popcorn movies with such reckless abandon behind them that I can't help but go along for the ride. White House Down appears in an aspect ratio of approximately 2.40:1 on this Blu-ray Disc. Though not the best image I’ve seen, the presentation looked pretty good. Sharpness remained positive. A few shots looked a tidbit soft, but not to a substantial degree, as the majority of the movie displayed appropriate delineation. I witnessed no signs of jagged edges or shimmering, and edge enhancement seemed to be absent. Source flaws also failed to materialize, as the film always seemed clean. Here’s the most predictable part of the review where I tell you that the movie’s palette focused heavily on teal and orange. As tired as I am of those choices, I can’t criticize their reproduction here; within those constraints, the colors seemed accurate. Blacks also seemed more than acceptable, and low-light shots showed good definition. Overall, this was a very good transfer. I felt more impressed by the strong DTS-HD MA 5.1 soundtrack of Down, as the soundfield took advantage of its many opportunities to shine. The action sequences opened up the mix to a broad and satisfying degree. They used the surrounds well and formed a fine sense of activity. The handful of quieter sequences created a nice feeling of ambience, and music offered nice stereo imaging. Audio quality was solid. Speech always sounded natural and concise, and I noticed no signs of edginess or other problems. Music was bright and dynamic, and effects worked well. Those elements seemed clean and accurate, and they presented very nice bass response. This was a fine track that merited a “A“. Across these, we hear from director Roland Emmerich, producer/composer Harald Kloser, producers Larry Franco and Bradley J. Fischer, action vehicle supervisor Graham Kelly, Reel Industries owner/president Cyril O’Neil, production designer Kirk M. Petrucelli, producer/writer James Vanderbilt, technical consultant Josh Young, stunt coordinator John Stoneham, Jr., co-producer/visual effects supervisor Volker Engel, on-set armorer Paul Barrett, special effects supervisor Cameron Waldbauer, co-producer/visual effects supervisor/2nd unit director Marc Weigert, executive producer Reid Carolin, director of photography Anna J. Foerster, and actors Jamie Foxx, Channing Tatum, James Woods, Maggie Gyllenhaal, Joey King, Nicolas Wright and Jason Clarke. In the featurettes, we learn about cast and performances, stunts and action, various effects, vehicles and weapons, sets and locations, story/script areas, cinematographer, and what Emmerich brings to the production. Even with about an hour at their disposal, the featurettes don’t give us a great look at the film. Oh, we do learn a reasonable amount along the way, and we get some good shots from the sets. However, the tone remains fluffy and we don’t get a ton of substance. The featurettes are worth a look but they’re not as strong as they should be. A Gag Reel runs six minutes, four seconds. Does it show anything other than the usual goofs and giggles? Not really, so it’s a predictable collection. The disc opens with ads for After Earth, Elysium, Grown Ups 2 and This Is The End. Previews also tosses in promos for The Mortal Instruments and Last Vegas. No trailer for Down appears here. A second disc boasts a DVD Copy of Down. It includes four of the Blu-ray’s 13 featurettes as well as some previews. No one will mistake White House Down for great cinema, but it doesn’t aspire to be anything more than what it is: a big, loud, fun popcorn movie. Down gives us a consistently breezy, exciting adventure despite its intellectual failings. The Blu-ray presents very good picture and terrific audio but lacks especially interesting bonus materials. Accept Down for what it attempts to be and you should enjoy it.